The #1 Source for Independent Android Game Reviews! so YOU can focus on playing them. I'm avoiding covering freebies given that there's no cost for you, our reader, to 'review' such games on your own and see if they fit into your gaming lifestyle. However, if there's a game that I feel particularly strongly about then I'll cover it. Blobby Volleyball made the cut. First, when I saw it I was so pleased as it remined me of one of the few (and I mean few) games I had on my old Pocket PC that I really enjoyed. The name of that game was Simbsoft Volleyball, but this is almost a mirror image of that game and I'm glad to see it. I'd easily have shelled out an obligatory buck for it. And I haven't seen any ads in the game either so this one is truly a labor of love for the developer. What's the sport? 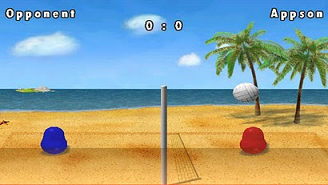 One on one volleyball in which you control a pear shaped blob in a game of beach volleyball. Quite simply, you hit the ball back and forth over the net until one side fails to return the ball within three hits per volley. Only the server can score so initially you may be fighting for control of the server if you are the receiver, and, as said, if you can't return the ball within 3 hits or the ball hits the ground before that then you lose the volley. Controls are entirely touch based. You slide your finder back and forth along the bottom of the screen to move your blob left and right and then there's a line (that doesn't appear to be visible in the screenshot) that you can slide your finger above to make your blob jump. The graphics... well, I've already said the game is the spitting image of a game that I had on my Pocket PC 6-8 years ago so there's little need to say more there. The graphics are fine, but when the title has 'blob' in it that should set expectations. As for controls, that's probably my only complaint with the game. I was used to the Pocket PC version in which I just drag on the blob itself to move and jump around the court. The system of staying below the line is a little alien to me, but shouldn't be a problem if you don't have the 'old' controls burned into your brain. Blobby Volleyball offers three difficulty levels that really are easy, medium, and hard along with a couple other game modes and multi-player mode over bluetooth or WiFi which I haven't tried, but is a pretty cool extra. This really it a nice, little sports title that has plenty of challenge and options in it. And for free this should provide some solid New Years entertainment. 4.5/5 stars overall, and a 5/5 for me on a personal level. This will probably be among my most played games in the coming monts if my addiction to its Pocket PC sibling is any indication. The last week of the NFL's 2011-2012 regular season is upon us and shortly after will be the playoffs. I made my SuperBowl prediction two weeks ago and, unfortunately, I'll only be seeing my favorite team in action after this weekend in football games such as this one. What? You want to know my SuperBowl pick, too? Well, read on and I'll reveal that along with a review of this game. 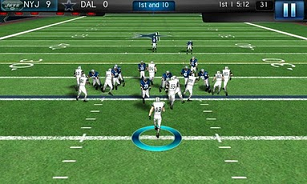 NFL Pro 2012 is taking advantage of the new freemium concept. A concept I lothe, hate, and despise. I don't blame software developers for it. If you, the customer, will support it and it generates the big bucks then I suppose I'd do it too. Instead of charging you $5 for a game I can charge you $1 per player, $2 for new stadiums, and... whoa... I can even charge you for the plays?? Suckerz! 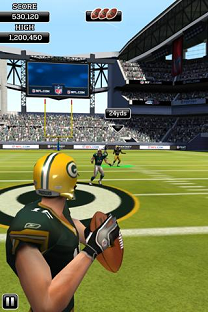 NFL Pro 2012 gives you 100 free credits to work with. Now, let's step back from the freemium aspect of the game and look at the game itself. It's great. Other than insanely slow load times (plan on eating a meal while the game loads... ok... exaggeration) of about a minute or so from start to actually playing a game it's really well done. I particularly like the simpler, but cleaner graphics over Madden '12. On a 4" screen (which apparently is my only choice as GameLoft games generally don't support tablets) I'd rather have less detail and be able to see things more clearly. Controls are decent too, although we revert to onscreen joypads and buttons for many actions. And then there's a nice tutorial that gets you going quickly while running some practice plays. Ok, so my first game... Redskins vs Giants. I receive the kickoff and have a reasonable return. I'm able to pass and run the ball down the field on my first drive and take it in for 6. And then comes the extra point. I still don't fully understand kicking and after a delay of game penalty I'm credited with a miss which I don't think is in the NFL's rules (I should lose 5 yards and get to re-kick?). But back to kicking... during a kick (field goal, kick off, ...) a bar appears and I can't find any instruction for this. It seems I have to drag down on the right side (where the bar is) and swipe with my finger on the other side of the screen to get a kick to happen. However, I'm always hooking to the left so I must still be doing something wrong although I am doing nice, deep kickoffs and punts. The game itself plays nice and smooth on offence. Pick a play. Players icons go from red to green when they are open for a pass. A back can sprint, spin, and do a power move. The QB can scramble. Aside from the onscreen joypad it's a pleasure to play. And on defense you just click on a player to take control of him. The sad thing is that I like this better than my experience with Madden '12 and it's great that we have two football sims on Android. But the freemium crap? I checked and I can buy up to $50 worth of points if I want to buy in bulk. In a nutshell, you probably have enough points to play a game or two for free after downloading the game and as you play you are able to earn more points. I didn't spend any time considering the purchase of a player with my points as I was too busy just buying plays. The game gives you the short plays for free, but if you want to do a medium or deep pass then you've got to pony up some credits and purchase that part of the playbook. You can either buy a play for one down, for the during of a game, or buy them forever to use in any future games. I learned quickly that it's best not buy buy them for one play unless you're just peeking at the plays in that part of the playbook so stick with buying them for the game or forever. 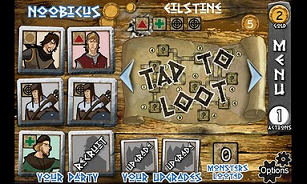 You can also unlock plays by attaining levels of progress in the game. I didn't tally up how much it would cost to unlock enough plays to enjoy the game and really, really, really wish there was a way I could just pay GameLoft's usual $7 for the game and play it all. So all in all, despite the couple of shortcoming such as not fully understanding the kicking game and the onscreen joypad/buttons I really think this is a great football game marred by going freemium. I'd give it a 4.5/5 if it wasn't for the freemium, and I'm not going to reduce that because it's freemium. Just know that it's not free, but rather free*. As for my SuperBowl pick this year: it's San Francisco. And if you win any money with that selection feel free to share. I've had a renewed interest in chess lately as I've been getting a bit tired of the EuroGames that I've been such a fan of over the past many years. Chess, the game of kings, appeals because of the pure strategy nature of the game. My problem with it has always been my lack of patience. A lack of patience when it comes to planning and plotting several moves ahead which is mandatory if I'm ever going to achieve any degree of proficiency with the game. Mix that up with a $.99 cent sale (that is still going on) by Polarbit and you've got me buying Chess: Battle of the Elements despite owning countless chess games already on a variety of devices. The key reason I purchased this game was for the chess puzzle portion of the game. In fact, if you're looking for a chess game with superior AI then you're looking at the wrong reviewer. I can't and won't comment on CBotE because I'm just not able to take it to task. It does play chess properly though and has nice elementally themed graphics, a good UI, and will display the chess board in either 2D or 3D although I stuck with 2D as I found it difficult to differentiate between the pieces in 3D mode. The game features many (and I mean MANY) chess puzzles and I'm working my way through them. To assist the neophyte the game will display each piece's valid moves after selecting a piece. I do wish it would show me valid moves positionwise and then somehow mark invalid moves based on moving into check just to help with learning, though, but that's a minor point. For each puzzle you have a number of moves that you can make (1 in the early going) to put the opposing king in checkmate. My one big problem with the game here was the having thought I had solved the first puzzle the game refused to let me make that move. Tap... nothing... tap... nothing. 'This is one heck of a puzzle' I thought. And then it dawned on my to try it on my phone (instead of my tablet) and it worked. So, this game isn't compatible with the Asus Transformer and I suspect probably isn't compatible with other Android 3.x tablet devices. Disappointing as I've grown accustomed to doing most of my gaming on my tablet given that I'm not a big traveler. (I also see this has been a known issue for some time so don't hold your breath waiting for a fix). At $.99 this is a great little chess game for beginners. It has good built in help/rules. It even provides hints as to which piece to move in puzzle mode. Given that I'm 'new' to chess I actually got stuck on the third puzzle and, from a learning perspective, it would have been awesome if there was some basic text explanation regarding the puzzle, but that's probably asking a bit much given the quantity of puzzles. I do wish it would wait and not just snap back to the main screen upon solving a puzzle so I could review the board after working through a trial and error solution. In the third puzzle my problem was not understanding that I could move a piece to threaten the opposing king and leave it also vulnerable to said king providing that I had also protected it. Makes perfect sense now and those of you with chess experience are thinking 'duh!' in reading that, but, once again, I'm a learner. So, all in all, provided that you're not buying this for tablet use and you're not expecting to play in 3D I think I can safely recommend this chess game. 4/5 stars. It's been over two years since I purchased my first Android device and gaming sure has changed on this platform. I remember being quite disappointed with Android gaming when contrasted to what was available on iOS, but I stuck with it and two years later and we've got games like Grand Theft Auto III making a showing on Android. However, and I've been wanting to do this for months, I think there are some titles that deserve a second look and I want to bring attention to them again given that this blog format really kind of stinks for a review website (and hopefully that will change soon so that reviews are better indexed in early 2012). I really need the ability to find reviews based on ratings and such. I'll also note that these are presented in alphabetical order as I have a hard time with top tens. How can I really compare a race game to a strategy game to a puzzle game and create a numbered order to them? These are simply games that are available, have made it onto my phone/tablet, and that have stayed there. They also have to be a few months old and of sufficient quality that I keep coming back for more. The only thing that matters here is fun and do I keep playing it month after month is my litmus test. Angry Birds - Angry Birds really doesn't need any extra publicity given all of the plush toys available for both children and dogs and the recently released board game version, but it gets play every day at our house now that my two year old requests it by name. Ok, I play it too. We're playing the Christmas Season 2012 levels right now that are a part of Angry Birds Seasons. I don't think Angry Birds is amazing, but it has maintained longevity and is so well polished that it's got a place in my top ten. Deadly Dungeons - I enjoy a good adventure, but there's something about the mobile platform that causes me to not want to play a deep adventure game and prefer a dungeon crawler that I can pick up and put down at will. You know... the kind of game you can play for five minutes while the wife uses the ladies room and you're left waiting outside. Deadly Dungeons fits that bill best for me and I appreciate that the developer has continued to maintain the game and is currently working on an expansion. Flick Kick Field Goal - I'm glad we've got a couple of full football games on Android, but neither has really been a staple of my entertainment. Flick Kick Field Goal, however, has. I like the variety of modes and that need to play 'just one more game'. Flight Control - Flight Control was a game I adored on my iPod Touch and was deperate for a good equivalent on Android. Many similar titles came and went and some were quite good, but the original Flight Control (which I don't appear to have ever reviewed) is the one that I've kept around. I even played it again this morning. Galcon - Another game that I first became familiar with on iOS and that had a few clones on Android before making the leap. Galcon is a real-time risk game with lots of modes of play such that you'll eventually hit that point that's 'just right' in terms of difficulty. And what a rush... the real-time element with ships flying back and forth really creates quite the frenzy of action in a game that's all about strategy. Homerun Battle 3D - Homerun Battle 3D is a game that shows off great use of the accelerometer control in mobile devices. In fact, I'm still wondering why nobody (including Homerun Battle 3D maker Com2US) uses this kind of control in a full baseball game. Nonetheless, this was and continues to be a blast to play. Panzer Panic -This game has to be the one game that I just can't comprehend why it doesn't get more attention. It may be my absolute favorite game if I had to pick one. I love dragging the little tanks around and flicking ink blots at other tanks... I love the debris that accumulates on the playfield... I love trying to coodinate multiple tanks at once although often I find myself keeping two out of harms way and playing with one. This fantastic game is so underrated. Yes, I'd like more in terms of objectives out of this game engine, but the skirmish mode has been enough for me to keep it around. QB Attack Deluxe Football - This game, like Panzer Panic, never seemed to get any attention. It also seems to have been abandoned by its developer at version 1.0 which also makes it one of the games that most depresses me. In a nutshell, it's a timing game where you're trying to complete passes to receivers and it's done very well. I've easily gotten my $1.49 worth of play out of it and much more and it's still well worth it even if the dev has abandoned it. It works great on my tablet, too (as do all of the other games in this list). PLEASE continue work on this one or send your source code to me so that I can. Roll Or Don't - A port of the old Sid Sackson board game classic called Can't Stop that is well done, has solid AI, and continues to get playtime on my phone. Not familiar with Can't Stop? It's a push your luck game that I describe more completely in my review. 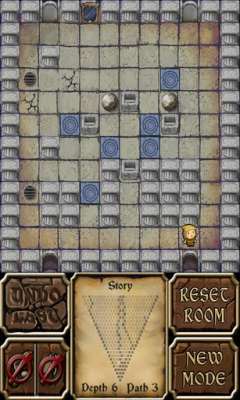 Slitherlink - Slitherlink is a puzzle game that is different, but requires similar logic skills to puzzles like Sudoku. I burned out on Sudoku in the years before I got an Android and this has perhaps filled the need for such a puzzle game. There you go... and I believe for under $20 you can own them all and I doubt you'd be sorry with any of them. A category that has really gained momentum on the iOS platform, but continues to be neglected on Android is the board/strategy category. Loot and Scoot arrived from tiny Victory Point games earlier this month and I'd been considering purchase of the cardboard version of this game. At $2.99 getting a digital one with AI didn't require any further consideration. However, when I went to download the game I was told I needed Adobe AIR first. Arrgh! I'd been trying to avoid that. I don't know why, but generally speaking the need for some separate runtime package usually correlated to a lower quality game and while I stand by that it made perfect sense for a game like this to need AIR as it would help cut development costs on a game that doesn't need a lot of flash (no pun intended). So I relented and have AIR on my Android tablet now and can give a fair review of this game. Loot and Scoot is different kind of game and a welcome change. The premise is that you're trying to loot your opponent's dungeon. And yes, you'll be both setting up a dungeon (in a basic sense) and then conquering dungeons that your opponents have set up. 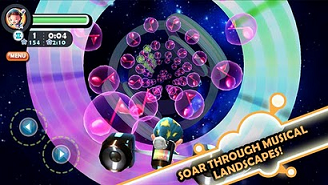 The game allows for up to four players in a pass and play mode or solo play against up to four AI opponents in easy, medium, and hard difficulty levels. The game includes good instructions, but I tend to learn by doing so after a cursory read I jumped right in and played and then went back to review the rules and gain a more complete understanding of the game. In a nutshell, you'll pick party members that each sport a symbol. Monsters likewise sport these symbols and if there's a match it means said character can attack said monster. You also have to set up a dungeon. I just let the computer do that for me (and really appreciated the "jump right in" option), but you can choose what goes where in an additional effort to out-strategize your opponent(s). Then, on each turn, you get two action points which typically consists of getting additional help via recruiting some cannon fodder or new party members and then entering the dungeon to try and loot some gold. Once you choose to move to the dungeon you are able to click a room at a time fighting monsters and taking their treasure. Combat is really simple. If your character's symbols match those on the monster being attacked then they get a die roll. Depending on monster placement it takes a roll of a 6 (or >4, but usually not) to defeat the monster so you'll want as many dice as you can muster. If you fail then the monster eliminates some of your party members (either sending them back to the inn for another day or, if you prefer, killing them outright) and you repeat until one side is dead. You can also choose to retreat. The game continues until a boss monster has been killed at which time points are tallied and a victor is declared. Points are scored for gold, killing monsters, and accumulating victory point tiles which are placed in the dungeon. I'm missing some stuff, but that pretty much covers the core of this game. So, what does this all boil down to? A good amount of luck with the dice rolling and the management of that luck (as if a monster defeats you then you'll know what kinds of characters it'll take to fight it next time and be able to recruit them at the inn). Hopefully it's clear that you don't conquer the whole dungeon in one turn, but over a series of turns (hence the game's title). It's in, grab loot, and then regroup at the end for the next turn with a focus on killing the boss monster at the end. Consequently, it's clear that this isn't going to be a game for everybody, but will certainly be enjoyed by those that like more brain than brawn in their game. I can see some not liking the luck element and, while it can be frustrating to see an opponent squash the boss on one dice roll, I find that dice rolling games actually lend themselves to a statistical nature where you have to decide what's worth the risk. Dice may decide a game or two, but strategy will push the favor one way or another. All in all, I like this game. I've played it several times and look forward to many more plays with it. The AI seems to be solid and while I can't claim to be a good player of this game I am pleased to say that I lost my first and second games on Easy mode which is always a good sign for the game's longevity. I do wish there was a video of the game as you really have to see/play it to understand it, and, quite frankly, I don't think the Market's refund time limit of 15 minutes is enough to make such a decision if you're on the edge. And while dungeon crawling is the theme there's really no adventure here. 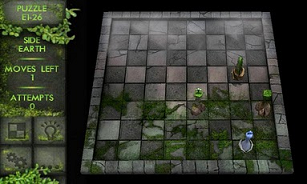 It's a dice based strategy game about raiding dungeons and defeating monsters. 4/5 stars. In a market crowded by puzzle game after puzzle game it's always nice to see something fill a gap. Android has had a few strategy war games, but none that have really shined bright. Great Little War Game (or GLWG for the balance of this review) looks like it fills the gap nicely. GLWG is a turn based strategy game with a little comic humor thrown in and a lot of planning and strategy. But let's jump right in with the bad side of things. My first complaint with the game is the lack of any real tutorial. Once you start the campain you are thrown into the thick of things with a few grunt units and the mission of killing the enemy. As a strategy gamer I want to know how far my units move, their range, stengths and weaknesses, ...etc. In GLWG you learn on the go and just have to muddle through the first mission. I couldn't even find any help screens to answer my many questions. On the positive side, my first complaint is also my only and last complaint. Graphically the game is more than decent for a strategy game and the audio is on par, too. The game has nice little animations for the characters and vehicles. When combat occurs the game will zoom in and show the volley of fire being exchanged. It's prettier that one would really expect from this genre and that's always a nice bonus. Control wise the game is simple. Touch a unit, you'll see how far it can move, touch where you want to move. The game also allows for undos in the event of a movement error, but I've been playing on my tablet's larger screen so that really hasn't been an issue. As you progress through the campain additional units are revealed. Grunts, snipers, jeeps, bazooka men, generals, tanks, ...etc. Back to my original complaint regarding the lack of instruction. After playing through a few missions and enjoying them I eventually noticed that on the screen where you produce units you are given info about each unit including it's movement and range as well as one or more green check marks indicating a unit's strength against other units (or a red X if it's ineffective against such enemies). And, after you've played you'll click that it's move and fire and whenever you fire on something and fail to kill it then the opposing units returns fire. Yes, it's entirely possible for you to die and the enemy to remain standing after combat. It also appears to show you a percentage that I haven't fully deciphered (my unit's effectiveness against this enemy?) and there's a little meter that shows you the strength a unit has left before death. As the game progresses you'll be capturing enemy fortresses and having to build new units as part of each mission's strategy and the game also supports skirmish and multiplayer modes (in addition to the 30 mission campaign) although I haven't had an opportunity to check those out yet. Whenever I get a new strategy game I work my way through the campain mode first for both the story and getting acquainted with each of the game's units. As stated, my complaint regarding instruction is my only complaint and this game shines beyond that. This really is a great little war game and is a must have for any Android strategy gamer. It's polished, plays smoothly, and with about 10 minutes of playing around you'll be able to learn the ropes despite the lack of hand holding. 5/5 stars. I'd been watching Earth and Legend and jumped on it today when it went on sale at 80% off. I guess perhaps that's my first issue. A price change from $6.99 to $2.99 isn't 80% off, but $2.99 seemed like a deal for a game of this scope. So I pulled it down... downloaded the extra game content and gave it a try on my Epic 4G. My phone clearly struggled with the game which I wasn't too surprised by, but it was able to play it. I walked around town... got my free Rusty Sword from the blacksmith... and then went to the store where I realized I had no money and figured earning some cash would be my next step. Then a big dialog box pops up telling me to leave the game a 5 star review in the market if I want to see free updates and they'll throw in 500 gold just for doing a review. So now I'm pissed off... about 3 minutes into the game I'm being asked to do a review??? Ok, so that's how this game has so many 5 star reviews. I decline to give a review at this point as, well, I'm certainly not able to do so in an honest and ethical manner and so I proceed. Crash. The game dies on me. Now, I'm not someone who bashes a game when it doesn't run on my phone because I know the Android platform has fragmentation issues and such so I try it on my tablet. I repeat the above just to see if it really is EVERY time that the game is going to attempt to persuade me to leave it a good review that it doesn't deserve and sure enough the process is duplicated. I pass on the review again, the game does not crash, and the next character that comes running down the lane wants to sell me RARE potions that do things like turn my pet into a pixie... so I say yes just because I can't believe that after buying the game the second thing it's going to do is tell me to give it a five star review without playing it and the third thing is to try and sell me MORE crap for realy $$$ under the guise that it's RARE??? Shame on you Dvide Arts. I loved your Crusade of Destiny game, but this is shameful. I can accept in game purchases and perhaps even a prompting for an Android Market rating an hour into the game, but not this. Fortunately, I was able to get my money refunded and move on. There's too much quality software out there for me to waste my time on something like this. The premise of the game is simple. Every night Jack dreams of his favorite toys. The actual game play, however, involves Jack floating through a tunnel like system (his dream?) and being able to rotate along the perimeter of this tunnel. Along the way he's got to collect his Z's and also has other objectives which might range from collecting (aka running over) toys to blasting them depending on the level. I feel like I'm leaving something out, but no... that's pretty much the game: rotate around while collecting, avoiding, or blasting stuff. Audio-visually this game is gorgeous. My two year old has taken a sudden liking to video games which is interesting given what little interest my older one had. Even morning it's "wanna pway Angwy Boyds". She was really quite entranced by the music on Sleepy Jack especially on the second level where you had to run over the notes to keep going otherwise things ground to a snail's pace. Control wise the game provides for the usual on screen buttons, accelerometer controls, or (my preference) sliding my finger horizontally along the screen to move Jack and tapping elsewhere to fire (if the level needs that as not all levels are based on violence). Sleepy Jack is a pretty fast paced arcade game. It reminds me of old arcade games like Tempest or Gyruss and yet really doesn't share anything with them aside from the rotational control style. The game's charm and AV quality is what keeps things interesting as the premise itself isn't really that exciting. Actually that reminds me a lot of Angwy Boyds... I mean Angry Birds... in that there are games that are similar, but just don't get it done whereas the big AB shows how extra polish can move a game from mediocre to good/great. As for Sleepy Jack... it's a good and simple little game and gets 4/5 stars. Thanks you for your countless sentences of praise towards this blog. I am as sincerely touched by such compliments as I am sure you are genuine in writing them. I am sure the extra bonus link to pirated versions of Android software has nothing to do with your posts, however, because of such links I cannot allow them to be added to the content of this blog. You are wasting your time here. Our next game on the roguelike beat isn't really a roguelike, but has a little inspiration from them. Block Rogue is a sokoban-style puzzle game, but with a couple interesting twists. Much like the amazing Spelunky, it's a game in a different gnere (here, puzzle games) that generates levels procedurally. Done well, it's a recipe for nearly infinite gameplay. Done poorly, it's an express route to tedium. How does Block Rogue do? Sokoban is a game that classically involves pushing crates onto storage locations. In each puzzle, you have a number of crates that need to be stored away, and you have to carefully orchestrate which crates are pushed when. Because of inherent limitations, such as the inability to pull a crate off a wall once it hits it (since you can't pull, only push), the solutions to sokoban puzzles can be quite intricate, often with a fair bit of backtracking. The puzzles in Block Rogue are not huge, with a 10 by 10 grid of squares available, but there are some very nice variations that happen. You will encounter both traditional crates, which move one square at a time as well as boulders, which roll until they hit something. You'll also deal with rooms featuring switches that toggle wall spaces as well as lasers that inhibit your movement. The combination of these factors lends quite a bit of texture and variety to the puzzles which I appreciate. I find that straight sokoban wears me out after a while, but at last count, I had solved more than 400 rooms in Block Rogue. The boulders, in particular, I find to be a lot of fun. Boulder-heavy levels give a feel much like the board game Ricochet Robot (which is highly recommended, by the way), where you have to coordinate carefully when and where to give your boulders a push, even using the crates as backstops for them. The puzzles are all pretty quick to work through, but interesting enough to not get stale. As I mentioned earlier, they're procedurally generated, and Block Rogue does a good job with it. You will get some pretty easy puzzles occasionally, but most are pretty interesting, and the easy ones can be plowed through quickly to get to another one. The generation of puzzles turns out to be a big strength of the game. If the game were just a string of randomly generated puzzles, that would be more than enough. But it also has a story mode, where you are collecting pages from a triangular-shaped dungeon, with magic mirrors and the pages you collect telling a cute story that I enjoyed piecing together. One recommendation is that you can set up the game so it generates random hard puzzles right out of the gate - it took me a while to find that option, and I played through the first few puzzles in the dungeon a lot before I figured it out. The graphics in the game are solid, doing their job with a distinctive style. The sound is fine, but as always, I don't always pay much attention to the sound. The controls are probably the only slightly negative thing I can bring up about the game. You control your character by means of slow swipes across the screen, which works OK, but I feel like it could be a little faster. A little bit of tweaking on the controls would be welcome - perhaps a slider in the options? One very commendable fact about the game is that it loads quickly and saves its state well, so it's very easy to jump in for a quick burst of gaming and jump back later. Overall, Block Rogue is one of the best puzzle games I've played on Android. The random generation of puzzles works well and is not at all a gimmick, the production is very strong and most of the details are right on. If you enjoy puzzle games, it's more than worth your $.99. If you're looking for a quick game that you can play in small gaps in your life, this is just about perfect. With just a bit of tweaking on the controls being my only suggestion, I'm going to give it a 5/5, as a delightful find. I suppose it's my civic duty to post this and, given that we're on day three, all I can say is better late than never. The Android Market is celebrating 10 billion downloads by partnering with various app developers to all but give their apps away and these are VERY highly rated apps. Check it out at https://market.android.com/details?id=apps_timed_promotion. X-Men has been installed on my Transformer tablet for some time now and it's never quite made it to the top of the list for my next review. I liked Captain America and have always thought the X-Men could make a great video game. This title, however, doesn't attempt to do that, but instead brings back the classic arcade game from the early '90s. So let's head back to around 1990 which was a time when one of the hot themes in video games was the side scrolling beat 'em up. I'm not sure what was historically first in this genre, but for me it was Double Dragon. Next it was Altered Beast which offered quite the graphical upgrade and, if I recall, that was around 1988. This game is from 1992, or 4 years later, and apparently took a step backwards in the graphics department, whether for effect or cost, and looks quite retro for better or for worse. The UI has actually been converted to be touch screen friendly... at least, that is, until you play it and then they revert to the tired trick of an on screen DPad and buttons. As a side note, I have started to see game developers use an on screen DPad that actually works well as it moves with your thumb. In a nutshell, you place your thumb... the DPad is centered on that point... and then you slide to choose a direction. I've been quite pleased with games that do that (and I don't recall the titles), but suffice it to say that X-Man does not and thus becomes a challenge to control. For those not familiar with the beat 'em up style of game here it is in a nutshell. You walk to the right/left on the screen using the DPad and cannot reverse course. Bad guys show up in droves and you have to fight them. 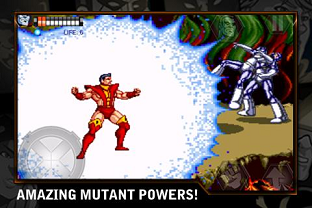 In X-Men you can jump and punch and also use a mutant power which almost acts like a smart bomb dispatching multiple enemies in one fell swoop. Repeat until the end of the stage at which time you'll meet up with a boss and have to dispatch him as well. On to the next level and repeat until you tired of the game or have a new high score with which to boast. The thing I've always thought would be neat with an X-Men game would be more of a puzzle aspect that takes full advantage of the various mutant powers from the comics/movies. Here the only real difference is in the graphics that result from such an attack as in the end they all seem to just kill everything your character is facing. I also can't help but be interested in the story line for this game as it repeats every time I play and presents Magneto as an evil mutant whereas I don't feel the recent movie series presents him in the same light. The movies seem to present him as untrusting of non-mutants, feeling that mutants are superior, and wanting to advance his own kind to the detriment of humanity. I just don't see that as "evil" although it's not exactly nice, either. I digress. As you can tell I'm luke warm on X-Men. It's not great... it's not horrible. It seems to emulate the old arcade game faithfully albeit with poorer controls although I wasn't a connoisseur of the original when it was in the arcades. And I have to be frank in that I've never been a fan of beat 'em up games in the first place as they generally seem repetitive and dull. As for my experience with the genre this rehash seems about average. One feature this does sport is multiplayer coop play over wifi and while I didn't try that I suppose it could add to the game if you can get 3 other X-Men fans together with their Android tablets. As for me, I give it 3/5 stars. I reviewed iDemolished almost 2 years ago. Wow, has time flown by. I enjoyed iDemolished and some of its kin quite a bit so when I noticed Demolition Master 3D (and its goal of taking these games into the third dimension) I bit. First, the premise is simple. You've got a structure made of girders of various strengths (wood, steel, ...), a backpack full of high explosives, and the need to flatten these structures to the ground (or, at least, below a predetermined height). You'll have to strategically figure out where to place your bombs to achieve this objective. And bomb placement is one of the first big differences. In a two space game played on a two dimensional screen there's no question as to what you're putting where, but in three dimensions the software has to be smart and iDemolished basically passes this test. It's a bit more cumbersome to work with and it'll focus in on a particular girder and somewhat let you reposition a bomb after incorrect placement although I found it easier just to remove any erroneously placed explosives and place them again. Next up... does it change the game? Well, one thing they do that I don't think iDemolished did is a level can have both target zones to hit with debris and zones to avoid (i.e. a gas pipe) and while that could be added to a 2D game there is a bit more to it when you have to think in terms of three dimensions. You can now place explosives on any side of a girder and such placement has obviously different consequences. You can be causing the splot on one beam to be north-south and another to be east-west and those can ultimately interact. Consequently, this game can be a bit more complex. Finally, is it better? And by better I mean more fun. And the answer is 'no'... it's just different: not better, not worse. It's not a 'me too' title and I praise developer App Mania for that, and it does make you think a bit differently. Furthermore, with a $.99 price tag you can't go too wrong. Graphically the game is up to par... not stunning, but good enough. It's also got a nice tutorial to boot and over 100 puzzles levels. I do find the controls a bit cumbersome, but still workable. 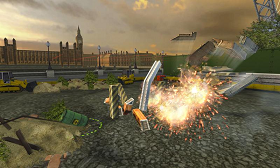 All in all, Demolition Master 3D is a good game that does the job. 4/5 stars. Infinity Blade not coming to Android? As for the reason Chair Entertainment isn't going to bring their prize game to Android... I'm not so sure. Piracy is an issue on both platforms and knowing that jailbreaking an iOS 5 device basically amounts to downloading some software and clicking a button makes me not buy that argument. They're already got the code written and the artwork in hand so the cost of porting (i.e. creating an Android version) would be substantially less. I know some love to point at Android and say "pirates", but I say "cheapskates". I don't know too many iPhone owners that don't take some advantage of the AppStore and if you'd purchased an iPod Touch then it's probably simply because of the AppStore. Android? I don't know of any Android owners that really take advantage of the Market. I know many that don't ever know it's there and some that have download a couple apps that are all freebies. That's the problem. Android owners aren't buyers. But the thing that amazes me the most about many Android owners is that they just don't care. I'll tell them of all the great apps they could have. I'll tell them that they can get a freebie every day from Amazon's Appstore. And they just look at me with that "it's just a phone?" look. What do I think Android needs? A marketing campaign similar to Apple's that touts the Android Market and all the neat stuff you could be doing with one. Remember "There's an app for that!"? How could you forget, right? Everyone interested in apps goes Apple because that's what they think of when they hear "app" and they don't understand that Android is now a fully viable choice. As for Infinity Blade... trust me... you don't care. NFL Flick Quarterback is the third of Full Fat's series of flick games (the other being soccer). It adds a full NFL license to the package which will apparently cost buyers an extra $2 (this game is $2.99 whereas the others are $.99) and allows you to be an NFL Quarterback. First, you choose your favorite team and you choose a name and jersey number and you're ready to play. Next up, it's practice time which means your receiver will not be up against any coverage. You'll learn to lead your receivers and the basics of tossing. Someone with experience from their other games will find this to be a cakewalk and I doubt others will have any challenge grasping the game. After some practice, you'll pass to a receiver that has defenders that can intercept the ball. Three mistakes and your game is over. You'll also, in later stages, have to deal with a rush and be able to flick to perform a spin move and avoid the DBs. Once you graduate to this you'll be making progressively more difficult throws into a bucket. That seemed like a step backwards to me... going from something like real football to tossing the ball into a barrel? 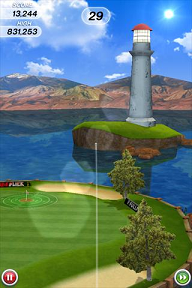 The game graphics and interface all are on par with Flick Golf! which is good, but golf really opened the world up to a variety of gorgeous scenery. I wanted to make it to the next level just to see what it looked like. In football I'm stuck in an indoor stadium. Furthermore, golf grades on the curve... I could flick and I'd get some points for being close and more points for being closer. In football... he either catches it or he doesn't. Sure he may run for extra points, but in order for me to score anything I have to thread the needle and complete the pass. Finally, the bucket toss just didn't do it for me and has caused me to lose interest in the game entirely. I actually enjoyed the football part of the game, but it did get repetitive after a few plays. Bottom line? If you're an NFL junkie then perhaps you'll get a thrill out of making a player on your favorite team and tossing the ball a bit. If you're just looking for a good flicking game then stick with the golf. It's superior and cheaper so my overall recommendation is to save your quarters. 3.5/5 stars. In my last appearance here, a while ago, I had a look at Sigmore Mines 2. I wanted to try some of the other roguelike games available on Android, since a well done game in the genre would be just about the perfect application for me. The next one I tried is Legends of Yore, a roguelike specifically created for mobile devices, and which is now available across a variety of platforms, including as a web application and on Facebook. I won't review the basics of a roguelike game here, but instead briefly recap that they're (usually) procedurally generated dungeon crawls. Legends of Yore actually includes an overland map as well as dungeons, which is always a refreshing addition to roguelikes. You start in a town with a handful of buildings, including the familiar stores and fantasy archetypes that populate games like this. After receiving a mission from the town clerk, it's off into the dungeon. Shockingly, once you descend into the dungeon, your first mission has you harvesting potatoes. OK, no, it's killing monsters and taking their stuff. The interface for accomplishing this is not bad, considering the constraints placed on games by the lack of keyboard and the size of screens. You can move around by tapping a location or by using an on-screen d-pad (or the keyboard d-pad). One issue with this control scheme is that you can accidentally click a location, causing you to charge around the landscape, possibly while monsters chew on you. But that's a minor issue, and the movement is pretty functional. Along one side of the screen are meters measuring health and a bar that varies by class (mana, rage or zen) and on the other side are a few menus for managing your character. Overall, I think the interface is reasonably frictionless and is a nice piece of work. The graphics of the game are in a deliberately pixelated style, going for a charming retro style that I find reasonably appealing. The layouts are appealing as well, with some care going into the graphics presentation. When combined with a solid interface, it becomes a very easy game to simply pick up and play. Contributing to that ease of starting out is the fact that you really only have to choose one of three classes and off you go. The problems really only crop up once you start actually adventuring. 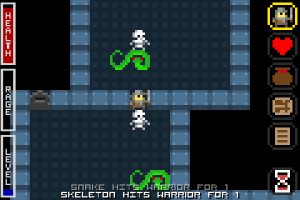 You'll kill a lot of skeletons and snakes at first. And that's it for a while. The environments in your first dungeon all feel pretty much the same, and you won't really be in any danger from these early encounters given reasonably competent play. With the archer I was playing, as long as I made sure to pump back up my zen (a boost for ranged attacks that recovers when you rest and goes away when you get clobbered in melee) I pretty much breezed through the first dungeon. It wasn't until towards the end that I encountered my first real surprise, a monster that could deform the environment of the dungeon (very cool). The feelings of similarity extend to other aspects of the game. Character improvement is very gradual, without much feeling of change. You just slowly get slightly better at stuff and don't ever really feel like you've crossed much of a threshold. Treasures tend to be mostly the same things over and over again, with lots of low level potions showing up in the first dungeon, for example. I was never bowled over by an incredible find. Eventually, you'll finish that first dungeon, where you are encouraged to take to the great outdoors. I was excited to give it a try, hoping that I'd see some interesting new environments and foes. While I did encounter some new bad guys, it was only refreshing for a bit, as instead of seeing snakes and skeletons, I instead saw truckloads of bandits and wolves. That theme was repeated throughout the game: in any given area, you would see a very narrow range of bad guys at any given time. It lent a very static feel to the game, since you were constantly performing the same things over and over again. I was wishing that things would get mixed up some. A bandit mixed in with the skeletons. A mummy chasing me through the forest. Something just to break things up. As it stands, the level of grind here is high, even by roguelike standards. In some ways, Legends of Yore is a nice piece of work. It's expansive, it has a clean interface and it does well in providing a smooth play experience. But it doesn't really have a spark to hold me to it. It's just a little bit too much of a grind without enough texture or surprise to fascinate in the way that a great roguelike should. I'd say that any roguelike fan should give this a try to see if it sinks its hooks into them, and it's not a bad intro for folks who haven't really played roguelikes before. But it didn't really work for me in the long term, so I'll go with 3.5 stars. Where's My Water is a Disney title. If you have little girls, as I do, then Disney = Princesses. But with Where's My Water there's a picture of a gator instead? Ok, uhm... is he eating the princesses? What's up with that? No, instead Where's My Water? is yet another entry into the hyper crowded puzzle game genre on Android. I'll agree that mobile devices make for a fantastic platform for puzzle games. I can solve a level here or there... they usually take advantage of the touch screen. But seriously... I'm really wanting a bit more variety. Simply enough in Where's My Water? Swampy the Alligator is trying to take a shower, but other gators loathe him for his eccentricities so they're always trying to cut off him plumbing. Apparently they're cool with him having electricity, though. 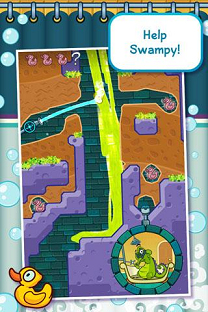 Nonetheless, this game becomes all about reconnecting Swampy's water supply so that he can take a shower with a traditional puzzle formula. The first level will have you digging a simple tunnel to let the water flow downwards into his shower. Ok, I'll cut to the chase... this is a puzzle game that does everything PERFECTLY. As much as I'd love to knock the behemoth known as Disney I can't do so here. What do I love about this game? First, the cuteness factor is great. It's got a lot of little extras in terms of animation and story that make it just plain attractive. Second, it walks you through the levels as a really nice pace. It starts with a confidence builder and then a basic choice and then... ok, no spoilers. Physics does play a heavy role in the game as you'll be wanting to get the water to jump across chasms and do all sorts of stuff. Third, it's just a buck. And there are lots of extras making this one of the best dollars you could spend. Fourth, no problems at all with the control and both the A and V departments are covered expertly (that's audio and visual if A and V didn't click). Me likes it! 5/5 stars. What can I say about Clouds & Sheep? Well, first off it's free and I'm trying to avoid reviews of such games. At the same time this one is different. Ok, not totally different as it really falls into a 'sims' style of game. This time, however, instead of managing a city or a family or a farm or a... you get the idea... you're managing a flock of sheep. If that doesn't sound like fun then you're right on board with me. It's not. Two things fascinate me about this game. The first is that over 36,000 people have given it a 5 star rating on the Android Market (and that dominates the runner up rating of 4 stars). I don't see it. Perhaps I'm so removed from mainstream gaming that I shouldn't be writing game reviews. Second, this game is VERY polished. It's beautifully done. And it's done by the company that has created one of my favorite Android games (Panzer Panic). Ok, what's it all about? You've got some sheep on a green pasture. They're really dumb and need all the help they can get. Dumb as in "hey there's food over there... but I'd rather stand here and starve" dumb. So it's your job to drag their lazy a@@'s to the food before they die. Obviously you need to grow food so you can do neat stuff like drag clouds together and tap on them to make it rain and create a little puddle thus watering the grass to grow more food. Or you can keep on a tapping and create a larger watering hole. And the game slowly progresses with more stuff like that. Very slowly. I actually started playing this while waiting half an hour in a dentist's office and only made it to the watering holes. From the screenshots there's all sorts of neat stuff that comes along later, but I just didn't have the patience for it nor the desire to grow more sheep. Typically when I see a game like this come around I expect there to be some grand strategy. The game bills itself as a sandbox style game. That it is. But let's use SimCity as an example. The thrill in that game is trying to grow a city while maintaining a sustainable balance of things like jobs, services, tax revenue, ...etc. Here that's lost on me. I'm just trying to grow my sheep herd. As I've already said, the game is quite pretty with its cartoony style graphics. Sound and controls match that polish. If the hot thing to do in real life was to raise sheep then this game would be #1! I just don't see it. It's awfully hard for me to rate this game or even call it a game. Obviously the goals in creating it were met almost perfectly, but the fun just isn't there... at least for me it's not... apparently 36,000+ Android owners would disagree. But it's free so you make the call. 3/5 stars. I picked up the Riptide GP demo back when I first got my Transformer tablet and was looking for games that took advantage of the Tegra 2 chipset. I had to admit that it really wowed me. The graphics on this game are drop dead gorgeous especially for a device that I can hold like a steering wheel. However, the $6.99 price tag scared me away. Since then it's dropped to $4.99 and there was even a $2.99 Halloween sale that was enough to put me over the top. 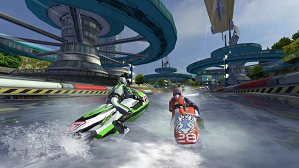 Riptide GP is basically a water racing game similar to arcade games like Hydro Thunder or perhaps more akin to Wave Racer on the Nintendo 64. I don't personally get too excited about racing around a track with the sole goal of trying to better my time. Does Riptide GP do much more than that? Honestly, no. It's got lots of pretty tracks and several vehicles with which to race that are rated on a few basic attributes such as handling and speed. On top of that the game does have a boost meter that you can recharge by doing various stunts and there are several that you can pull off. The games controls are pretty simple. Tilt to steer. Hold down anywhere on the lower left side of the screen to brake. And if you choose to control acceleration then you can hold down on the lower right to accelerate although auto-accelerate is on by default. Then there's the boost meter on the right that you can touch for a burst of speed. Stunts are executed by dragging your thumbs on the lower left/right while in the air. The keyword there is thumbS as it took me entirely too long to process that. I was getting quite frustrated at my in ability to dance in the air when I drag my thumb on one side of the screen or the other. However, the help clearly documents the different thumb patterns that perform fancy moves along with the fact that both thumbs must operate in synchronicity. For some reason I prefer water racing games over car racing games. I don't know why... that's just me. The reality is that this isn't going to be a game that consumes a lot of my time. It'll get some attention here and there and will be a go to game when it comes to showing off my Android Tablet to the iPad masses (not that it beats the iPad... it just puts us on par with it). It's a beautiful game that's really executed very well. It's got Open Feint support for online leader board support (and it would have been awesome if I could race over the Internet), but it doesn't quite have the extra oomph to make this a must have... especially at $5. If you love water racing games or need another graphical gem for your collection then by all means grab this one, but if you can wait then I'd hold out until the next sale or just grab the demo. This is a quality title for any Android owner with a Tegra 2 (or better) chipset that just seems to be missing that little extra bit of fun that makes me want to play it over and over. 4/5 stars. I know a lot of Halloween Sales have been going on over the weekend and it's awesome to see these sales finally spreading to Android. We're closing in on the end of them so hop to it if you've been missing out. First off... Riptide GP has dropped from $6.99 to $2.99. It's an awesome Hydro Thunder type game for Tegra 2 devices such as the Transformer tablet. It looks and plays great and is now available at a great price, too. Next... Polarbit is having a $.99 sale. A lot of their games are a steal at that price and I've reviewed several of this. Reckless Getaway is one of their recent hits and Raging Thunder 2 is a great, albeit older, racing title. Toki Tori is a fun little puzzle platformer. And their Family Pack - All In One looks like a great value at this steal of a price. And then there's Electronic Arts... not quite as generous at Polarbit, but Madden 2012 is $2 off at $4.99 and FIFA 10 is just $.99. All of their titles have a price reduction of some sort including The Sims 3 which is also $4.99. 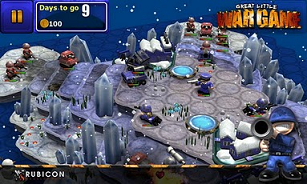 Finally note that Chillingo's titles are under the EA umbrella and games like Spider Jack and The Wars are just $.99. I really was apprehensive about Flick Golf! and its claim of an 'accurate in-flight spin control', but tonight that changed. I've played a lot of Flick Kick Field Goal and have to admit that sometimes the question of accuracy enters my head. I don't think there's a problem with that game... I think it's probably a combination of my inaccuracy as a human and my phone's hardware (probably more so the former than the latter), but there are times when I'm convinced I've just knocked the ball dead center down the middle and for some reason it hooks. But we're not talking about football... we're talking about golf. Flick Golf! 's secret? You not only flick the ball off of the tee, but you can also control it while it's in flight. That sounded weak to me at first, but after playing it I am a believer. In a nutshell, their system lets you flick while the ball is in flight, but your flicks carry less weight in your overall shot as the ball approaches the hole. And that's actually pretty cool because it means if you hook it then you've got a short moment to work on correcting that so while it may not be realistically it sure is fun and that's what games are all about. But first, let me say that Flick Golf! 's graphics are beautiful and include great attention to detail. Furthermore, the game looks great on my phone's small screen and my tablet's big one. This is one pretty game. On the audio front there's not much to talk about. Sound effects match the game and are not a distraction, though. And control consists entirely of short swipes (aka flicks) and that is handled well. The game also plays very smoothly. Your goal? To get as many points as possible. The game does feature unlockable courses and essentially each hole is like a target and the closer you get to sinking a shot the more points you earn. Let's also note that, unlike golf, you get one shot at a hole and those extra swipes after the initial shot do not count against you like extra strokes do in real golf. Instead, you're working against a timer. That adds some pressure to get that ball in the air as soon as possible instead of plotting and planning your next, great shot. Flick Golf! does give you control over the camera although I've had no need for it. It's always been clear as to what I'm aiming for and the timer forces me to avoid playing with the camera. All in all, this is a game I've enjoyed far more than I thought I would. I enjoy flicking games and really though nothing would eclipse Flick Kick Field Goal. Does this eclipse that? No. But they're equals and that really speaks highly of this as I'm much more of a football guy than a golf guy. And at a tad over a buck this is a game to get if only to stare at the scenery. 5/5 stars. I was first introduced to Clowning Around on my iPad and was pleased to see it make the jump to Android. It looks like they did a pretty good job on the conversion, too. This is among the few games that my five year old loves and, given that I'm a bit surprised that she's not more into games considering my massive collection, I am always grateful to a publisher that can capture her attention such that she actually ASKS to play it again. Notable flops include Kinectimals and I'm still puzzled over that as it's a solid game, but I digress. 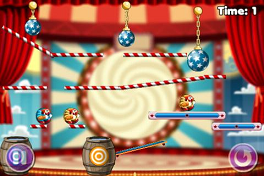 Clowning Around is clearly one-upsmanship on Cut the Rope. Instead of candy, you've got clowns. Instead of a monster waiting to eat the candy, you've got barrels that the clowns are trying to land in as a part of their act. Then you have various pieces of circus equipment such as platforms, trampolines, cannons, and, of course, chains that need to be cut in the proper sequence with the proper timing to allow everyone to reach their intended destination in a timely manner. I should also note that levels can include multiple clowns of different colors and each clown must land in a like colored barrel. Is this better than Cut the Rope? No. I think it's equivalent. The tutorial is well done and progression is smooth. And, yes, my five year old loves Cut the Rope, too. At the time she'd play whichever was available (i.e. on the device I wasn't using) as I had Cut the Rope on my Android tablet and Clowning Around on the iPad. Now, it doesn't matter... they're on both. And they're both excellent games. Looking for something like Cut the Rope, but want some new challenges? You'll be in heaven. Love circus music? Well, you'll be treated to a nice musical score while the game gets started. The graphics in this game are good. The clowns are more like 'clown balls' as the clowns are rolled up in the balls as they acrobatically drop and bounce into their water filled buckets. As each one arrives you'll be treated to a nice 'ta da' style bow. Another nice difference with this game is that there's a physics element as the clowns will bounce and roll to their destinations in addition to just dropping. Sound effects are solid and, just like Cut the Rope, touch screen swipes are all that you need to play although admittedly I've had a glitch here and there with that that I hadn't encountered with the iPad version more than once. However, when I would test it to try and prove a problem I could never do so therefore I have to conclude that perhaps the glitch is with me. Clowning Around is some solid circus fun and that's coming from a guy that's scared of clowns (yes, me and Cosmo [wonder how many will get that reference]). It's available in both a paid, ad free format and a free ad supported format although the ads are unobtrusive. 4/5 stars. There are so many good games on the Android platform now that it is becoming of difficult to keep up with them all. With the Droid Incredible's problem of "Not enough space" rearing its ugly head quite often for me I usually try to keep no more than 30 or so Apps on the device. This doesn't leave me with a lot of room for games but the ones that I do have I really enjoy playing. I decided to summarize my top 10 favorites as of October 2011 and place them in a post with links to the marketplace in case some of the new Android users out there may have missed some of these gems. With that, here is my current list of top 10 games on my phone. This list is in descending order with the number one title being my current favorite. Remember, we all have our favorites and this list is mine, you don't have to agree but please be nice if you decide to comment, thanks! 10. Fruit Ninja - A lighthearted, easy and quick to play game that was born on iOS. Basically you use your finger as a "sword" and try to slice fruit as fast as you can while avoiding the bombs. Great graphics and a very nicely done interface. 9. Angry Birds Rio - After having all the Angry Birds titles on my phone for quite some time I have settled at this one being the only one currently occupying space. It's the best of the bunch in my opinion and the most challenging. 8. Dynamo Kid Touch - A great side scroller similar in vein to the classic mario series but quite a bit more challenging in some respects. Just try to get past world 4! 7. Enjoy Sudoku - Simply put, the best Sudoku game I've found in the marketplace. Easy and intuitive controls and virtually endless puzzles. 6. Lane Splitter - For a nice arcade racing rush you simply can't beat this one. Uses the accelerometer for turning and gets harder and harder. The global high scores keep you coming back for more. 5. 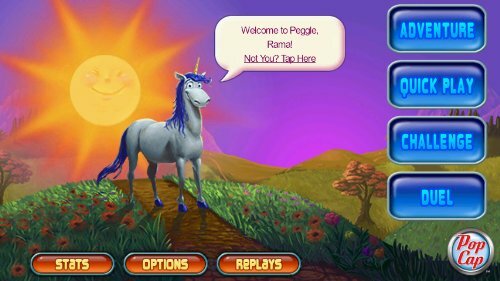 Peggle - For the money, a great puzzle game that is hard to master. Lots of levels and you can play a single level in about 5 minutes which makes it a great time killer. Only complain here is the slow load times. 4. Stellar Escape - Another side scroller but this seems to be one of my favorite genres on the phone. Another quick pick up and play and finishing a level without mistakes can be quite challenging. 3. Words with Friends - Even though this thing is still buggy as hell I keep coming back to it. It's scrabble with your facebook friends. Just get it. 2. Cut the Rope - Another great puzzle game that originated on iOS but has decent Android support. Too many levels to mention, a great value and lots of fun. 1. HexDefense - I think I mentioned this in my full review of this game but to this day I fire this game up more than any other on my device. Hands down the best tower defense game I have played on the small screen. Get it. Once I put this list together I went back and dropped a few and added a few. Other notable titles are iRunner which I recently reviewed here and Greedy Spiders which is a bit new to be on an all time favorite list yet. Other favorites are Hanging with Friends, Plants Versus Zombies and Random Mahjong Pro. Finally, for a gem swapper you simply must try Tropical Fish Shop, it's a blast. I hope you enjoy my list, as it changes over the months I will strive to create a new Schoon's best-of post. Thanks for reading! All articles and reviews on this website are (C) Copyright 2009, 2010, 2011 REEVEsoft, Inc. Awesome Inc. theme. Powered by Blogger.